Ninja Crafts, I have found, can be quite polarizing. Some parents think they're super fun and great for birthday parties. Other parents are uncomfortable with kids using weapons like a sword, ninja stars, and such. While I don't condone violence, I do realize that making toys that shoot, launch, or fly (like this pom pom shooter, car launcher, or this 1 sheet paper kite) are always crowd pleasers. (Plus, they're a great opportunity to slip in some STEAM learning.) So today I'm sharing this cute Ninja Throwing Star Craft. It was super easy to make and kept us relatively sane on a stuck-at-home-going-to-pull-my-hair-out-cleaning-the-pulled-out-puzzles-for-the-eight-time rainy day. This post contains affiliate links. This means I make a teeny tiny bit of money from any purchases made through the Amazon links below. Thank you for your support! For my full disclosure, click here. If you're looking for an easy superhero activity, boy do I have one for you! 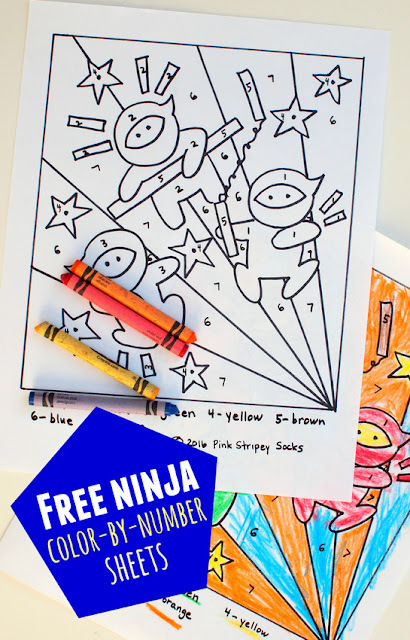 Our love for all things ninja continues with this free printable ninja color-by-number sheet! Does your child love ninjas? My preschooler loves them! They're sneaky, stealthy, and carry cool weapons. 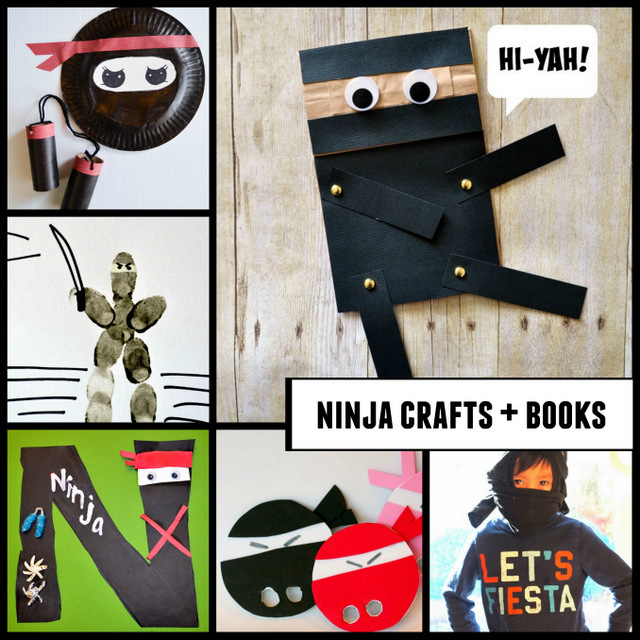 If you have a ninja-loving kid too, here's a great list of ninja crafts and books that are perfect for preschoolers! We've got paper plate crafts, finger print crafts, toilet roll crafts, paper bag crafts, puppets, and even an easy costume idea! Does your child totally dig ninjas? Then this post is perfect for you! We love making easy, homemade costumes and today's is my favorite idea so far. Here's a super quick way to make a t-shirt ninja mask! All you need is a t-shirt and a minute. That's it! No sewing or gluing required! 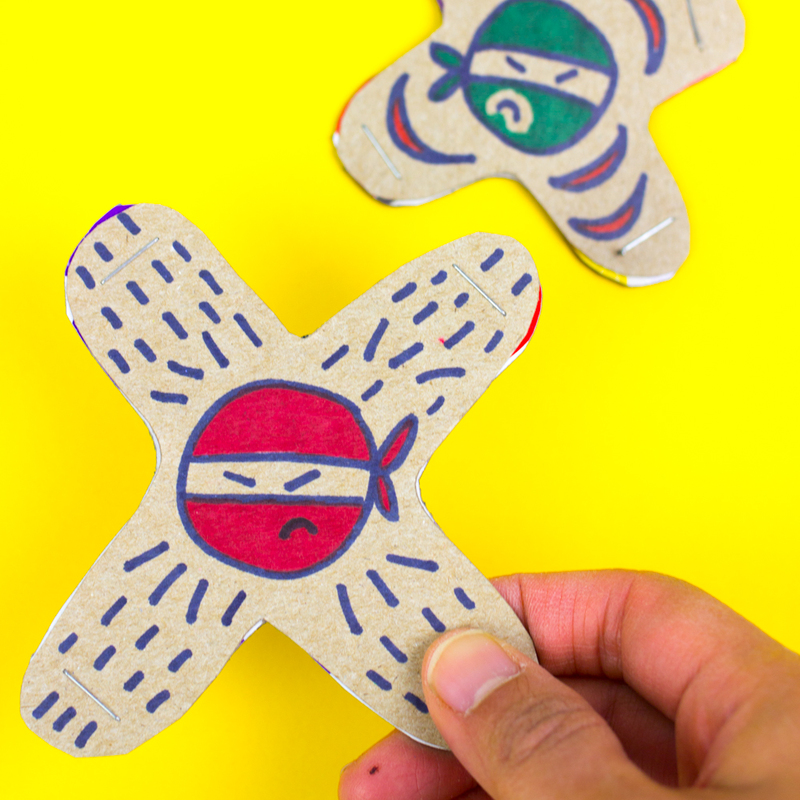 Super Quick and Easy T-Shirt Ninja Mask!